Its first shoot at Little River on the 6th October comprised nine or ten shooters and a photograph of the group showed the rifles on the day to include an M1 Carbine, an Israeli Mauser and an SMLE No1 mk3. 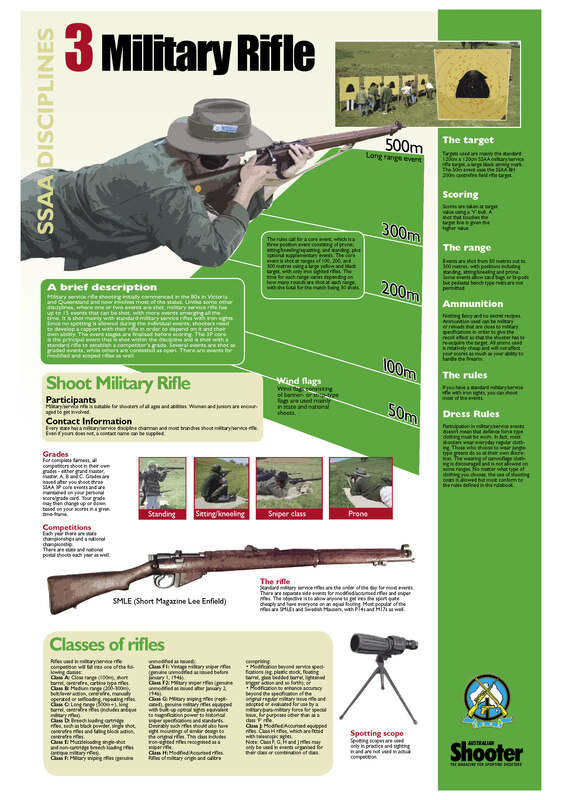 Members believed there was enough interest in shooting military rifles to form a sub club and put forward a proposal to the SSAA. The SSAA supported the development of the club which had its first organised trophy shoot on 5/10/86, which was won with a Lee Enfield No4. The MRC runs monthly competitions for standard and modified military rifles over ranges out to 500m, as well as regular commemorative shoots to recognise D Day, Long Tan, and Victory in the Pacific. The core event is a three position competition shot at 100m, 200m, and 300m. It also shoots a number of other competitions which are included in the national Combined Services Discipline rule book. These include snap and rapid fire events, as well as deliberate long range precision events. Regular shoots are held at two separate venues. A member’s first three shoots will be ungraded. A competitor’s initial grade is determined by the lowest score of the first three matches recorded in the club’s official grading records. Any three scores shot in the next grading bracket will result in members being automatically upgraded to that level. Grading cards are available if members shoot regularly at other clubs. Monthly meetings are held at the Springvale facility on the 4th Thursday of each month except in December, presentations are made in addition to keeping its members abreast of the day to day running of the club. Every month the MRC holds a ‘show and tell’ relating to firearms, equipment, reloading, or special interest speakers. Within the Military Rifle Club, there are two other specialist clubs which have been formed to provide a wider range of activities and services for the members: the Military Pistol Club and the Military Collectors Club. The MRC likes to encourage members following their first 12 months of membership to qualify for the SSAA Range Officer’s course. This assists greatly in the running of the Ranges. The MRC has for many years been involved each year in a number of major competitions with several Victorian Rifle Association clubs. These competitions have fostered good relationships between the SSAA and the VRA and have led to some VRA members joining the SSAA . They have also been instrumental in a revival of interest in the shooting of traditional military rifles within the VRA. The club’s facilities at the Eagle Park Range in Little River include a fully equipped clubhouse with wood heater and storage facility which provides members with a gathering point on range days and enables the club to store its own targets, frames etc. This provides direct access to the rifle, pistol and shotgun ranges at the Eagle Park Range. The MRC produces a bi-monthly magazine named Parabellum to keep members informed of the clubs activities. It includes general items of history, firearms reviews, a calendar of events and a trading post. Parabellum has become a quality magazine for members, and not only records the events and happenings of the club, but is a journal of quality writing on military firearms and history. Parabellum has been the avenue of first publication for a number of original articles written by participants in the Second World War, and by their direct family of participants. It has also featured articles about research on firearms, swords and other militaria that have not appeared elsewhere. Members can also place ads free of charge in the magazine. An excellent range of club-owned firearms offers members the opportunity to settle into the club without purchasing a firearm immediately. Observe what other members are using, both pistol and rifle, feel free to ask any member about the firearms they have selected and why. They will only be too pleased to offer their opinions. One of the great enjoyments of the club is the vast amount of knowledge shared by its members. The MRC welcomes new members to enjoy and appreciate this knowledge and asks them to consider that they may be able to contribute to it.